"Roasted eggplant in a French roll with feta cheese, basil and garlic mayonnaise. This was my favorite sandwich of all time, adapted from a cafe at the University of California, Irvine." Preheat your oven's broiler. Brush eggplant slices with olive oil, and place them on a baking sheet or broiling pan. Place the pan about 6 inches from the heat source. Cook under the broiler for 10 minutes, or until tender and toasted. Split the French rolls lengthwise, and toast. In a cup or small bowl, stir together the mayonnaise and garlic. Spread this mixture on the toasted bread. 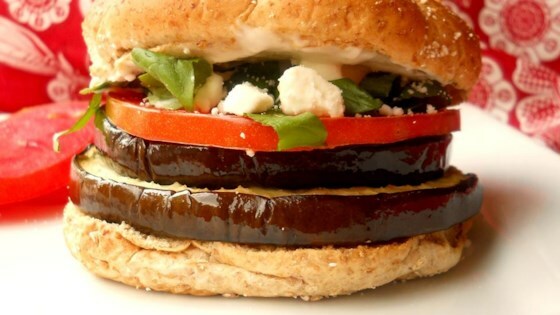 Fill the rolls with eggplant slices, tomato, feta cheese and basil leaves. My husband (who is a meat and potatoes man) loved this recipe exactly like it is and can't wait for us to have more eggplant in our garden ready so he can eat it again! I thought this was one of the best sandwiches I have ever had! I followed the recipe. I did peel the eggplant and I think I would slice it thicker next time - but delicious! !